This guest post was written by Martin Seibert, a German Internet media consultant. Google Wave is a hot topic at the moment. The ambitious group collaboration and micro-messaging platform started rolling out in beta via an initial batch of 100,000 invitations two months ago. Many people still want invitations. Among those who’ve tried it, some criticize it, some praise it. For now it has a lot of usability problems that are described below. Yes, you should look at Google Wave. But there is no need to desperately long for an invitation yet. Nevertheless, this post outlines how you’ll probably use Google Wave in the future and also gives you advice on how to implement it in your company or your team of coworkers. It also reveals some big usability problems in the current version. Those issues aside, I would like to show you the advantages of the “wave” once again and describe some cool use cases that might make you love it at some point in the future. 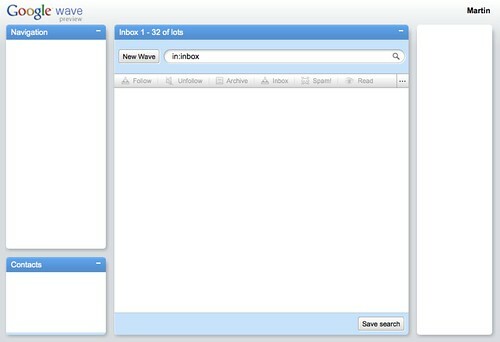 The user interface of Google Wave breaks new ground and yet is not unfamiliar as its layout resembles the inbox of your mail application. The timeline that lets you recap how the wave has evolved and changed since your last visit is something that even wikis don’t have today—a feature that will surely be copied extensively in the future due to its intuitive usability. Furthermore, the user interface motivates further contributions to the wave. This is an excellent way to convince a lot of people to participate. It is a completely new experience to actually see your friends, colleagues and contacts type in and change content in real time. No other application apart from a few client-side chat tools currently offers such a service via a web interface. If you’re a tech geek, you’ll love that part of Google Wave. It is a powerful innovation when it comes to real-time communication and collaboration. It is competing with the well-known comforts of email, wikis and chat, but in a lot of use cases, I think Wave will win. What is Google Wave good for? Even if “all this stuff” is relevant content from your teammates, you’ll have to filter and sort it all out to make it manageable. I believe it’s possible, but Google Wave users will have to learn how to do it. There is no professional revisioning system in place yet. If somebody messes up your wave and you want to undo it, you’re in for an unpleasant surprise: You have to do it manually. So folks, please do not delete too much content on waves. At the same time, Google Wave does not offer a way to permanently hide replies. Result? The main text in the wave is disturbed by images, boxes, colors and text from all participants. This can become a real mess and might even prevent you from reading the important content. The Google Wave team should definitely address this. Right now Google Wave is not suitable for real usage as too few people have an account. If you can’t invite everybody, the value of a wave decreases dramatically. Where are notifications for updates of the waves I follow? There are no means of monitoring waves. This is Google Wave’s biggest weakness. I don’t get an email, Gtalk alert, or any other notification in the communication systems I already use today when there is new activity in a wave. As I am still heavily using RSS feeds (in contrast to other TechCrunch authors—by the way, almost 4 million TechCrunch readers use RSS feeds as well), I’d love an RSS feed of the waves I want to keep an eye on. Unfortunately, this isn’t yet an option. For a real chat, Google Wave is much too slow. The performance of live transmissions varies from good to very poor and back without any understandable pattern. Today, you’ll want to keep using Skype or Jabber clients for chatting. I expect this to change, once we see local implementations of Google Wave in companies. Most of the server power can then go to the companies’ employees, clients and partners. If there are peeks, Google Wave seems to have trouble with the load of lots of users. Here is a screenshot that I see way to often. There isn’t an export feature to my beloved wiki yet. I’d love to have the wave content “natively” (not as an embed) in my Confluence, Foswiki (TWiki), XWiki, Mindtouch, DokuWiki or MediaWiki whenever I want it. To Google and wiki vendors: please give us that kind of portability. Why do I need a Google Account to participate in a wave? That is a big problem if you want to engage with clients and non-tech-savvy users. There is no source code view in Google Wave that you would want to use as an experienced wiki user to control what appears and how. The following list to be a bit premature. As one cannot install Google Wave yet, this is just a checklist to help you prepare for it. Server infrastructure and a good sysadmin: You will clearly need a server and a skilled admin to set up a Google Wave server, if you want to use it in your company. If you want a lot of employees, partners and clients to use it, you should prepare to invest in good hardware to make the real-time experience a good one. Up until now no one has been allowed to install the preview version of Google Wave. This means that nobody knows how difficult or easy it will be to install it and how easy it will be to connect it with other public wave servers. Still, it should be helpful to have a sysadmin around who knows what he is doing. 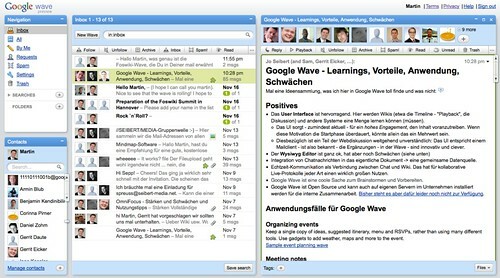 HTML5-compatible browsers: Google Wave is an HTML5 application. If your company still works on Internet Explorer 6 or below, you will not be able to use Google Wave flawlessly. Therefore, make sure all participants have access to up-to-date browsers. Fast web connection: A decent web connection for both servers and clients is highly recommended to have a good real-time communication experience. Firewall configuration: Your admin should know how to configure your firewall so that your Google Wave server can communicate with the world. Define the goal of the wave and make sure everybody understands the purpose and the content of your wave. If you don’t, a lot of “side-noise” will arise. Create wave guidelines: You should set up guidelines for your wave participants to make sure they understand what the wave is for. What application is to be used? Differentiate the systems in your company so that everybody understands when to use emails, wikis, chats, databases and when to use Google Wave. How to set them apart? I don’t know. This will emerge organically. Give Google Wave a purpose: Make sure people understand how to use Google Wave. You don’t want them to turn it down before even testing it thoroughly. That is especially true for the non-geek users. Not too many wavers on one wave: You should beware of inviting too many people because you can’t kick them out afterwards. Do not delete content without permission: My brother had created a new wave to evaluate Google Wave. We were all filling in texts, comments and arguments. Within a very short period of time, a really cool document had evolved, and I thought: “you should make this a blog post.” So I started to restructure it, changed arguments and content into text, and deleted the comments afterwards. The bashing and flaming that triggered from people who were angry with me for killing their content was enormous. Make rules and copyright clear: After I had restructured our wave and taken all the bashing for deleting the obsolete comments, the first participants asked if they could use the content in their blogs. We became aware of the as-yet unanswered question: “Who owns a wave? Who may do what with it? Who is allowed to use its content?” Make sure to clarify this in advance with your coworkers. Be aware of the complexity: The basic use and advantage of Google Wave should be clear to your employees once you roll out Google Wave. If the purpose is not clear, its complexity will quickly drive away many of your colleagues. Good luck trying to convince them to come back. For now, consider only inviting geeks: Today, nobody can really control documents in waves, and there’s no real revision yet. And waves change a lot. Therefore, it’s better to invite people who can give good feedback. The more wavers, the more complex a wave will become. If you criticize Google Wave, you should keep in mind that it is a “preview” now. It’s not a beta, and it’s not a final release. The Google Wave team has set out to create “email as it should be in 2010”. And from what I see, they have a good chance of doing so, but 2010 is less than two months away. However, I am willing to bet that this piece of software will eventually overcome Robert Scoble’s criticism. For professional collaboration, I still recommend the wikis mentioned above. 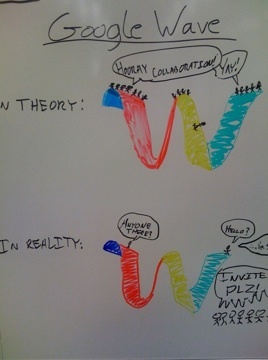 But if you’re into real-time collaboration, Google Wave will eventually be your choice. Just make sure to bring advanced web skills.